Want to know when’s the best time to hike the Tongariro Alpine Crossing? You might have heard about how busy it gets. Or you’re wondering when’s the best weather. The Crossing can get very busy. And it’s difficult to know in advance when the weather will be fine. This doesn’t mean you can’t have an amazing Tongariro Crossing adventure. You can! All it takes is a little knowledge and some planning! The Tongariro Alpine Crossing is hiked all year round. Summer and winter. Summer is the most popular time to enjoy the hike. The summer hiking season is from November through to the end of April. During this time about 130,000 people hike the Crossing. During the summer season there's around 1000 people hiking the track daily. On fine days it’s busier and on poor weather days it’s quieter. Because any fine day on the Crossing can be very busy it's important to book a place to stay and shuttle in advance. By doing so you’ll avoid the stress of turning up and finding everything is fully booked. The track can get crowded. Here’s a helpful tip for you. If you don’t like the idea of hiking with hundreds of people start early. Find a shuttle company who’ll get you to the start before the masses. Easy! The Tongariro Crossing can be hiked during winter. It can be a spectacular experience. The track is covered in snow and ice. So most people need to go with an experienced mountain guide. Guiding companies provide all specialist equipment, transport and expert guidance. You don’t need any alpine experience as mountain guides are with you every step of the way. The winter months are July, August, September. If you have alpine experience and know how to use crampons and snow axe it’s possible to hike the track unguided. Finding a shuttle company to drop you off and pick you up can be tricky. Snow, ice and winter conditions can happen during the shoulder months. Which are the months of May, June and October. Every year is different. Some years there's a lot of snow on the track during these months and other years there’s little. If you're considering the Crossing during these months you should seek expert local advice. We often get asked what months have the best weather. This is difficult to answer because from year to year the weather is different. For example, last summer we had beautiful warm weather during November and December. But the summer before it rained most of the time during these months. Every year is different. This is mountain country so weather can be a challenge to predict and plan for. 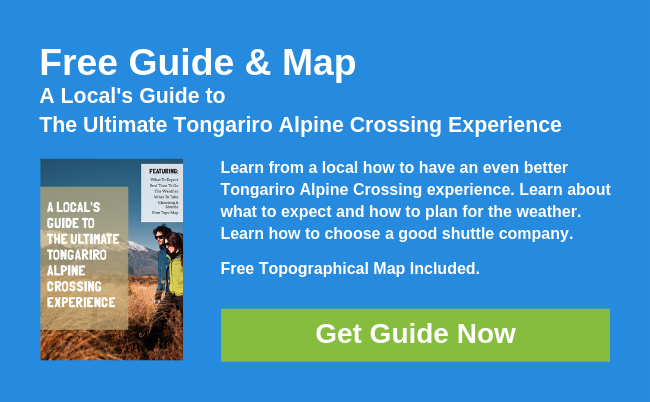 If you’d like to learn more about how to plan for Tongariro Crossing weather click here. My favourite time to hike the Crossing is early to mid November. The track is normally clear of snow and ice. But there’s still snow around the lakes and in the craters. This creates another contrast and can be very beautiful. Over the years November has been a little quieter but this is quickly changing. My second favourite month to do the Crossing is April. I love the clarity and freshness of a fine day during Autumn. It’s hard to beat! Oh, I should add I like to start early. On any given fine day during the summer the Tongariro Crossing can be crowded. Especially if fine weather arrives after a period of bad weather. If the fine weather is forecasted tourists will wait around. When the fine day arrives there could be two or three days worth of tourists on the track. Once again, I recommend starting early. Traditionally Easter is one of the busiest weekends on the Crossing. I would personally avoid doing the Crossing on any holiday weekend. It can get crazy busy. If you do end up planning the hike for a long holiday weekend I recommend starting as early as possible to avoid the masses. And make sure you book well in advance! 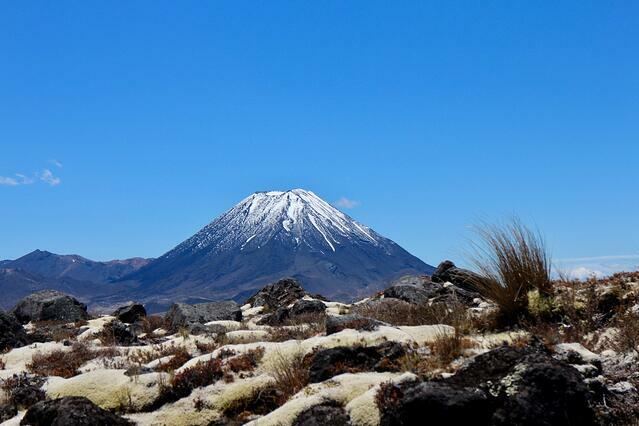 We’re passionate about helping you explore & discover the power and the beauty of Tongariro. We won't give your email to anyone. Full Stop. We will email you with useful information and special offers from time to time. You can Unsubscribe whenever you wish.